You can edit the Windows Registry with the help of Console Registry Tool or reg.exe. Reg.exe is a command-line utility with which you can perform almost all the task which you otherwise can with regedit.exe. Reg.exe can be useful when you want to quickly make a change to the Windows Registry without opening registry editor and moreover and has the additional facility of being directly usable in scripts. 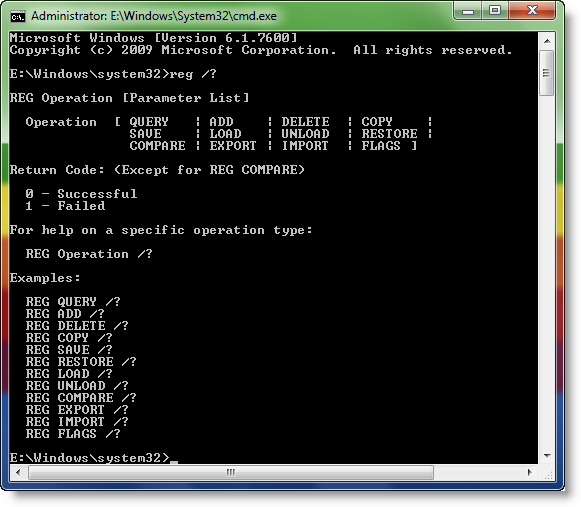 To run the reg.exe, open cmd, type reg /? and hit Enter. This will show you the parameter list, syntax & the return codes. This excerpt appears with the permission of The Windows Club. The Windows Club windows registry edits. permalink. Should You Consider Building Your Own PC?